Description: Z WSPSBD8-22A With BNSF 7243, BNSF 7242, BNSF 4057, BNSF 761, BNSF 6608, & BNSF 7259 with 64 Loads, 4879 Tons 6684 Feet. Photographed at 18:10. Description: Z WSPSBD8-22A With BNSF 7243, BNSF 7242, BNSF 4057, BNSF 761, BNSF 6608, & BNSF 7259 with 64 Loads, 4879 Tons 6684 Feet. Photographed at 18:21. Description: A new GEVO leads another stack train down the BNSF Transcon at MP 26. 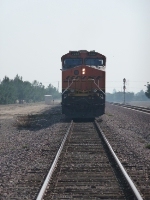 Description: Trailing as a DPU on an eastbound intermodel. Description: Brand new ES44C4 on its way back east on its first round trip out GE Erie, PA. Those C4s are a neat concept, and they look pretty when they're new, but after a couple trips they're just another dirty boring BNSF GEVO. Title: BNSF 7242 Leads another z train WB into Town. Description: Ex santa fe train 199. 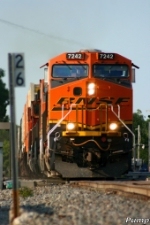 Description: BNSF 7242 leads a westbound intermodal train at Rochelle, IL. Title: WAMX 3517 and other's sit at the TRRA yard. Title: 3 Ge's rumble a stack over the Frozen Des Monies river. Description: Approaching Talmage, BNSF 7195 rolls north, timetable west, on the Strong City Sub. Description: At Talmage, BNSF 7195 rolls north, timetable west, on the Strong City Sub. Description: BNSF 7242 - BNSF 5198 in first and second on a triple-header double-stack aimed southbound in the passing lane in early November where we managed to dodge what shouldve been a deluge or rain - instead, barely cloudy with only a few spits of rain. The altered weather pattern actually creating some color in the trees as they lose their leaves (at least the ones that survived the summer drought and didnt go into early stress leaf loss).